Quantum, Please welcome our new guest writer Sadri Hassani. He is a professor emeritus of the Illinois State University’s Physics Department. Professor Hassani is especially focused on how some people use the weirdness of Quantum Theory to promote pseudoscience. Follow him on his Skeptical Educator website. Pseudoscience has been rapidly gaining grounds in the past several decades. The dietary supplements and homeopathic drugs, advertised by the disgraced Dr. Oz and his ilk, now constitute a multi-billion dollar industry. Major universities house centers of integrative health, which offer courses in acupuncture, Reiki, Therapeutic Touch, Qigong, and Vedic medicine, and are funded generously by the National Institutes of Health (see here). Elsevier, a reputable scientific publisher whose journal Physics Letters has published articles of Nobel Prize caliber, is publishing Explore, a journal devoted to pseudoscience. Icons like Vani Hari (aka The Food Babe) and Vandana Shiva have gathered armies of uninformed citizens, ready to sign petitions in hundreds of thousands to force their anti-scientific demands on the food industry. Major contributing factors to this rapid growth have been various misrepresentations and misinterpretations of modern physics, especially quantum theory (QT). From its inception in the early 1900s, QT has baffled both the experts and the laypersons. Its highly mathematical character and its invisible domain of application make QT both extremely counterintuitive and dangerously prone to abuse. To see how quack scientists exploit QT, it is important to first understand what it is and how it was discovered. One of the major puzzles of the end of the 19th century was the mechanism by which heating a metal produced light (more precisely, electromagnetic waves). The study of the behavior of the production of electromagnetic (EM) waves through heat led to the notion of a black body radiator (BBR), an idealized object which absorbed all EM waves impinged upon it. At the gate to the twentieth century, Max Planck discovered that in order to explain BBR, he had to assume that EM waves produced by heat consist of tiny discrete carriers of energy which he named quanta; the energy of each quantum being proportional to its frequency. The constant of proportionality, now deservedly called the Planck constant, happens to be a very small number. In scientific units, it is 0.000…000626 with 33 zeros after the decimal point! Five years later, Einstein generalized the notion of quantum to all EM waves, not just those produced by heat. He went further and postulated that EM waves of all sorts consist of real particles which he called photons. His postulate was later confirmed in an experiment designed by Arthur Compton in which photons were scattered off electrons, much like the scattering of billiard balls. Now there were two ways of thinking about light: wave and particle. But there was another particle, electron, discovered in 1897. 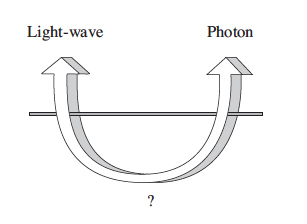 If EM waves consist of photons, could it be that electrons are part of some kind of waves? Louis de Broglie thought affirmatively, and he came up with a relation which connected the wave and particle nature of the electron using the Planck constant. The de Broglie relation, which also holds for photons, was assumed to be universal and hold true for all particles. This is the famous quantum mechanical wave-particle duality. EM waves were predicted by Maxwell in 1865 after he successfully and completely unified electricity with magnetism through a modification of a set of four equations, now appropriately called Maxwell’s equations. If Maxwell’s equations describe EM waves and photons, what wave equation describes the electron? At the time there was no such equation. It had to be discovered! In January 1926, Schrodinger found a wave equation which described the behavior of the electron as it moved inside a hydrogen atom. But what exactly was this electronic wave in the Schrodinger equation? In June 1926, Max Born suggested that the electronic wave was related to the probability of finding the electron at a particular spatial point at a particular instant. In spite of resistance by some noted physicists like Einstein and Planck, Burn’s probability survived. Today, almost a century later, Schrodinger equation in conjunction with Born’s notion of probability is still valid and is the theoretical basis of all quantum phenomena and inventions like transistors, lasers, LED, superconductivity, quantum dots, and scanning tunneling microscope. when a quantity is too small to be measured by even the most sophisticated instruments available, one has to say that the quantity is zero. In this and the subsequent posts, I’ll show how quack scientists ignore these pitfalls and make QT the “scientific” basis of their claptrap. But first we have to know something about waves. Tap the water of a still pond with a stick regularly and observe the circular waves, consisting of crests and troughs, produced on the surface. Generally, a wave is a regular disturbance of a flexible medium. A guitar string is another example of a medium in which waves are produced. The distance between two consecutive crests (or troughs) is called a wavelength. If you look closely at the pond, you’ll see that each point of the water executes an up-down oscillation, and because of the bonding of the water molecules to each other, this up-down motion gets transferred to the neighboring molecules. That’s how a wave propagates in the medium. The speed of a wave depends on the properties of the medium, but is independent of the frequency of oscillation. Increasing the frequency decreases the wavelength so that their product, which happens to be the speed of the wave, remains unchanged. The maximum up-down distance of oscillation is (twice) the wave amplitude whose square is (proportional to) the intensity of the wave: a bright light has larger amplitude than a dim light. Mathematically, a wave is described by a function, which varies with space and time, and can have positive and negative values, with the up motion being positive and down negative. Let me pause here for a moment and alert the reader about a common pitfall concerning waves. If the motion of water is confined to an up-down motion and the wave propagates sideways, what exactly is propagating? Since matter is not moving sideways, waves must be nonmaterial! This is a conclusion to which many pseudoscientists cling. Deepak Chopra, for example, employs this idea to claim that it is possible to create matter out of nothing. On page 95 of his book Quantum Healing, he shows the diagram shown below – which BTW is his version of quantum mechanics, but of that later. The quantum mechanical wave-particle duality becomes – in Chopra’s quantum world – a wave-particle transformation. And since waves are nonmaterial, the diagram “proves” the creation of matter out of non-matter: mind (non-matter) creates body (matter). But are waves really nonmaterial? Or, since a wave is motion transferred from one molecule to the next, is motion non-material? Motion is described by velocity and acceleration. So, the question boils down to: “Are velocity and acceleration nonmaterial?” Now you can see the nonsense in the very phrasing of the question. Velocity and acceleration are properties of matter in motion. It doesn’t even make sense to ask whether a property is material. A red sheet of paper is material. Does it make sense to ask whether redness is material or not? Our (material) body gets older as we age. Does it make sense to ask whether age is material or not? This confusion of matter and its properties is one of the most dangerous pitfalls in which even the experts can fall, and one of the most effective tools that quack scientists use to promote their woo. The most abused confusion of matter and its properties is arguably the equivalence of mass and energy, the content of the famous relativistic equation E = mc2. On the left is energy, a property of matter; on the right is the mass of some particle. So, suggest some promoters of woo, since energy is nonmaterial, this equation is a mathematical proof of the transformation of nothing into something and vice versa, and the equivalence of body and spirit. What these promoters of woo don’t tell you is that the energy on the left is the property of some real material particles. These particles can either produce the mass on the right by binding together, or can be produced by the mass on the right as it decays! There is absolutely no instance in nature in which mass transforms into energy without some material particles carrying that energy. Back to waves! Take a screen that blocks a wave; drill two holes in the screen so the wave can pass through the holes. On the other side of the screen the two holes act as two sources of wave, and their waves “interfere” with one another. What is the consequence of this interference? Consider water waves. Each of the two holes produces a wave described by a function. When these waves reach a particular point of the water, each wants to oscillate that point in its own way. The result is that the total oscillation is described by a new function, which is simply the sum of the two. This is called the superposition principle, which is an all-embracing principle that applies not only to waves (and quantum phenomena, as we shall see below), but also to ordinary situations. It is, for example, responsible for a boat to go northeast when the engine pushes it northward and the water flow carries it eastward. Since the two waves functions could have positive and negative values, it is possible that at some points, called constructive points, both of them are positive (or negative) and at other points, called destructive points, one positive and the other negative. At constructive points the amplitude of the oscillation is larger than either of the two waves, while at destructive points the amplitude is smaller than the bigger wave. For quack scientists, the quantum wave-particle duality can be a source of mystical pleasure! Take an opaque screen; cut two very narrow and very close slits in it. Cover one of the slits and send a beam of light to the screen. Capture the light that passes through on a photographic plate. The image of the hole shows up as a blob on the plate, something like the figure on the left shown below. Cover the other slit and repeat the experiment. Same blob forms on the photographic plate. Now open both slits. Because of interference, the image on the plate is now alternate bands of bright (corresponding to constructive interference) and dark (corresponding to destructive interference) regions as shown in the figure on the right. Nothing surprising! Now repeat the experiment, but instead of sending a beam of light to the slits, send photons one at a time. When only the first slit is open, photons pass through that slit and – after a sufficient number of them are sent – form an image in the shape of a blob on the photographic plate. When only the second slit is open, the same image is formed. Now open both slits. When a photon reaches the screen it’ll pass either through the first slit, in which case it will land on the photographic plate at one of the points of the image formed in the experiment in which the second slit was covered, or it’ll pass through the second slit, in which case it will land on the photographic plate at one of the points of the second image. So, when you send many many photons, you expect to get two blobs on the photographic plate as shown below. But that’s not what happens! You’ll get the same interference pattern as you did when you sent a beam of light. That’s really spooky! In fact, it is so spooky that it gives great ammunition to promoters of woo to attribute consciousness to photons!
. . . How did the photon in the first experiment know that the second slit was not open? Think about it. . . . When we fired our photon and it went through the first slit, how did it ‘know’ that it could go to an area that must be dark if the other slit were open? In other words, how did the photon know that the other slit was closed? There is no definite answer to this question. Some physicists speculate that photons may be conscious! The square of (the absolute value of) Ψ is the probability of the behavior of the system. That is why I referred to Ψ as probability wave, not probability. If there are two paths for the system to develop, the total Ψ of the system is the sum of the Ψs for each path. This is the superposition principle that we encountered in our discussion of waves. Zukav is trying to “explain” a probabilistic outcome and falls into the trap of consciousness. There is absolutely no way that one can “explain” probability. Here is an example that shows even ordinary objects like coins can gain “consciousness” if you try to “explain” their probabilistic behavior. Take 10 coins. Toss them many many times. You’ll see that, on the average, about 20% of the times you’ll get 6 heads and 4 tails. Put slightly differently, 20% of the times you’ll get 60% of the coins to turn up heads. Now take 10,000 coins. Toss them many many times. WARNING! Quantum physics is based fundamentally on probability. If you try to “explain” the outcomes of quantum events, you may turn into a crackpot, as have many people, including some physics PhDs. Do not keep saying to yourself . . . “But how can it be like that?” because you will get down the drain, into a blind alley from which nobody has escaped. Nobody knows how it can be like that. Probability does not allow any “explanation.” Period! Any attempt to “explain” probabilistic events, such as quantum phenomena, leads to the introduction of super-physical, super- natural, spiritual, non-scientific, anti-scientific, preposterous, and . . . crackpot ideas!